The apartments form part of a small boutique residential complex of just three designer apartments. The World famous Bondi to Bronte coastal walk is three steps away from your front door, Bondi Beach is only a couple of minutes walk away and the main shops, restaurants and cafes are also only a couple of minutes walk away from your front door. Truly THE BEST place to be in all of Bondi, and in all of Sydney for Summer time. Stunning interiors with crisp white walls, luxurious American Oak polished timber floors, high lofty ceilings,designer retro furniture and fabulous outdoor terrace with indulgent lounges. Contemporary, stylish and overly spacious. Quite simply THE BEST location in Bondi Beach, an exclusive property at an enviable address. 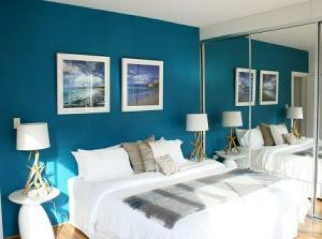 Exclusive designer beach side apartments, located next to world famous Bondi Beach. Nightly rates vary from $269 to $699 depending on length of stay and day of week. Minimum 3 nights stay on Friday and Saturday nights. Rates online are indicative only, increase and decrease in rates apply throughout the year depending on special events, peak periods and quieter times, please apply for specific rates. Street parking only. Minimum stay of seven nights over Mardi Gras period. Other minimum stay restrictions also apply to some peak periods/school holidays. These apartments are located at the south end of Bondi Beach and are only a stones throw from the beach and Bondi Beach shops, bars, restaurants and cafes. The world famous Bondi to Bronte Coastal walk is located three doors down, and is THE MUST DO Activity when you visit Bondi Beach, or even Sydney. These exclusive apartments are truly THE perfect location for accessing the beach each morning, and an enviable position for not just holiday makers, but the envy of Sydney siders as well, throughout the fabulous summer months and the beautiful sunny winter weather we have come to enjoy here in sunny Sydney. .
2 BEDROOM APARTMENTS: *Apartments are spacious and stylish inside. 120 square metres in total floor size. Facing north east, they are fresh, light and breezy, with a fabulous covered outdoor terrace area. *The living areas are one large open plan space with 3 meter high ceilings, large white spaces, stunning underwater feature wall and beautiful American Oak timber floors. *There are two spacious bedrooms, both with large built in wardrobe spaces, polished timber floors, king size beds (can be separated into single beds), and beautiful quality furnishings, to give a fresh calming beach side feel. *Two large bathrooms, one with full size bath, shower, toilet and twin sinks, the other with shower, toilet and sink/vanity. hairdryer is supplied. All bathrooms have beautiful Molton Brown Bath and Body Products. Bath and hand towels supplied, as well as bath mats and face washers. *Kitchens are full sized, fully equipped and open plan, including dishwasher, oven and stove, full size fridge/freezer and they come packed with cooking utensils, crockery, glassware, cutlery etc. *Lounge areas are massive and open plan, with crisp white walls and beautiful designer furniture. Lounge rooms have L shaped lounge and arm chairs, and dining area has a stunning Knoll Marble dining table. There is also a 42 inch in LCD TV, CD Stereo System, DVD player, Free 512K broadband internet , and IDD telephone with free local calls. *Internal laundries have top loader washing machine, iron and ironing board. For all standard bookings we require 21 days notice in the event of a cancellation. All special event bookings cannot be cancelled.